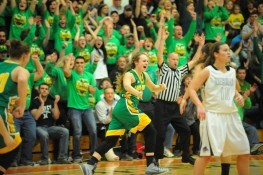 Brazo’s proclamation was made following Tippecanoe Valley’s 60-45 win over Rochester in the IHSAA Class 3-A girls basketball northern semi-state in a commanding performance by the Lady Vikings over its Three Rivers Conference rivals. Valley never trailed in the contest and used a true team performance plus the support of a standing-room-only crowd to make the state basketball finals for the first time in school history. Valley jumped out to a blistering 11-1 lead right from the get-go and only had Rochester put up one serious charge in the second half. The Zebras made a push in the third quarter, trailing 34-30 after Ali Larkin drilled a three while Valley star Anne Secrest sat on the bench with three fouls. Viking head coach Chris Kindig decided he couldn’t wait any more, and called No. 50 back into the game. The move paid off. Tippecanoe Valley stopped Rochester on its next possession and Taylor Trippiedi immediately drilled a three to put Valley up seven. Meredith Brouyette then hit two huge threes, the first with Kindig pleading for her not to shoot, but glad to see Valley claiming a 46-36 lead. Brouyette scored nine points in the fourth and 16 overall in a monster performance. Secrest was again a problem for Rochester. Going for 11 points and 20 rebounds the first time the two teams met for the TRC title in late January, Secrest frustrated Rochester again in the semi-state with 16 points, 14 rebounds, four blocks and three assists. The sophomore did not take over the game like she has done in the tournament, but her presence was known, notably during Valley’s run late in the third quarter. Trippiedi was consistent once again, scoring 14 points on 6-10 shooting and had three steals to boot. Caylie Teel, who again had to fight through another rolled ankle suffered in the third quarter, added seven rebounds and seven assists, And not on the stat sheet was the job Karis Tucker did on Rochester’s leading scorer, Alexa Holland. Tucker’s defense on Holland, who came in averaging 17 points per game in the tournament, held the Zebra sharpshooter to six points on 2-8 shooting. 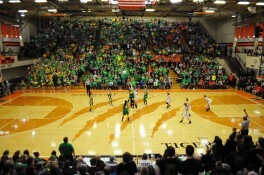 For the game, Tippecanoe Valley shot 56 percent (22-39) from the floor while Rochester was just 25 percent (12-48). Becky Malchow led Rochester (23-5) with 16 points while Larkin and Keaton Stesiak each finished with 10 points. Rochester’s season ends in the semi-state after upsetting No. 2 South Bend St. Joseph in the sectional finals and No. 1 Benton Central in the regional semis. 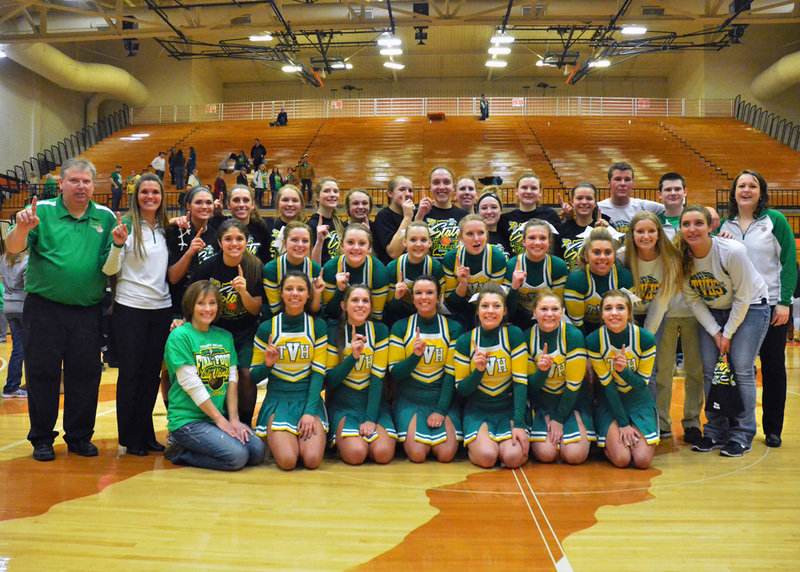 The Zebras lost to Valley, 52-40, in the regular season matchup that gave the TRC title to Tippecanoe Valley. Tippecanoe Valley (25-2) moves on to next Saturday’s IHSAA State Finals to meet Princeton (29-1), which destroyed Indianapolis Chatard, 77-38, in the southern semi-state. Tucker is going to need a Herculean defensive effort next week to shut down Notre Dame commit Jackie Young, who scored 43 points Saturday against Chatard and is now the all-time single-season leading scorer with 967 points. In the first game of the day in the 2-A semi-state, Darby Maggard wasn’t sharp, making just 5-17 shots and missing all 10 of her three-point attempts, but finished with 18 points. But 20 points from Mason VanHouten has Fort Wayne Canterbury heading back to the state finals after an overwhelming 57-39 win against Wabash. The Cavaliers (23-2) held the Apaches to just 20 percent (11-54) from the floor and didn’t let Wabash into double digits on the scoreboard until the third quarter. Claire Cromer wound up with 19 points for Wabash, which bows out of the tournament at 24-4. Canterbury will rematch Heritage Christian in the 2-A final. Heritage beat Providence 61-41 in the southern semi-state and beat Canterbury in last year’s 2-A final. Hannah Dunn launches a shot against Rochester. Rochester’s Alexa Holland drives to the bucket against Tippecanoe Valley. Rochester’s Morgan Ruff works hard for a layup attempt. Rochester head coach Tony Stesiak urges the Rochester faithful to make some noise during a second-half rally. Meredith Brouyette of Tippecanoe Valley reacts after drilling a three against Rochester. Taylor Trippiedi, center, hugs mom (and assistant coach) Alyssa Trippiedi while Karis Tucker hugs coach Chris Kindig near the end of the semi-state victory. 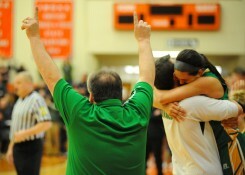 Tippecanoe Valley head coach Chris Kindig raises his hands in celebration. 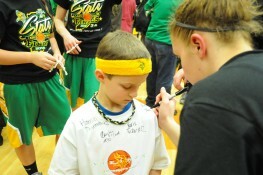 Nate Engstrand gets an autograph from Anne Secrest. 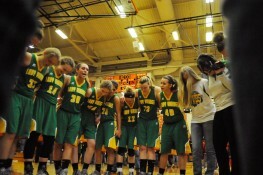 Tippecanoe Valley huddles in celebration after beating Rochester.